This feeding Wood Stork uses “tactolocation,” sweeping its bill from side to side until touching prey and closing its bill in 1/40th of a second! Let’s step back to the Everglades of the 1900s. This pristine area is virtually untouched, and for nearly 5,000 years, a sheet of water from the overflow of Lake Okeechobee has developed this region into a haven for a large variety of reptiles and other animals, including many bird species. One of those bird species — the wood stork. Let’s fast forward to the 1930s. Development south of Lake O is taking place in the form of farms and ranches. Even further south, the logging industry has increased substantially. Efforts to drain the Everglades are going on; water control structures are being built; and Tamiami Trail is now a reality. Approximately 5,000 to 15,000 pairs of wood storks are nesting in the region, but that number is dwindling very quickly. The Everglades have changed forever. Just like the Everglades ecosystem, this stork is endangered. They were once more abundant here than in any other region of the Southeastern United States. Because the wood stork is a very specialized species that desires tropical or subtropical habitats with distinctive wet and dry seasons, they thrived in this area. This “Preacherbird” (so called because of the solemn pose it takes after eating) has long legs, a featherless head and a very prominent bill. It will grow to more than 3 feet tall and have a 5 foot wingspan. It is the only stork native to North America, thus the only one breeding in the United States. It joins a host of other record-breaking birds that are seen in the area. The Frigate bird has the largest wingspan-to-bodyweight ratio of any bird on the planet. The migrating White Pelican has the second-largest wingspan of any North American bird (second to the California Condor). The Peregrine Falcon also passes through our region — the fastest animal on the planet with a diving speed of more than 200 mile per hour. When fishing, the wood stork can snap its bill shut in 25 miliseconds. That’s 1/40th of a second!!! its submerged bill from side to side as it walks through the water. When the bill touches any prey…..snap!!!. The bill closes faster than any other vertebrate that we know. As we come into drier seasons, like now, fish are concentrated in smaller pools because water levels decline — a result of our winter dry period. Thus, the effectiveness of this feeding technique becomes more important. This behavior has evolved since the Everglades came to be. Since this natural hydrological cycle is now upset by man, wood storks fail to feed sufficiently and successfully nest. Each breeding pair, approximately six pounds each, requires nearly 400 pounds of fish during its breeding season, which begins in the dry season. When breeding is successful a female will lay two to five eggs, and both parents will incubate the eggs for about one month. Also, they are colonial birds, and prefer to nest near other storks. Without enough food, the breeding process does not take place. By 1995, fewer than 500 pairs of wood storks were nesting in Everglades National Park and the Big Cypress National Preserve. That is a decline of more than 90 percent in the last 70 years. This does not mean that they are becoming extinct, but they are moving to more suitable habitats like Georgia, South Carolina and North Florida. 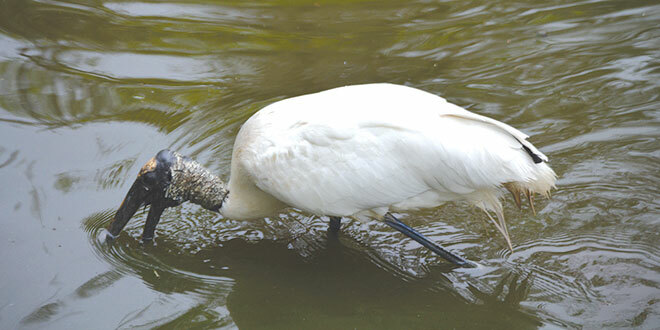 The wood stork is now an “Indicator Species” for the restoration of the Everglades. This region has been incapable of supporting populations of this stork and other wading birds, which have also decreased by 90 percent, for several decades. Programs like the Comprehensive Everglades Restoration Project (CERP) and other revitalization efforts should cause an increase in wood storks sightings. Only by maintaining and improving this ecosystem will wood storks again thrive here. Very simply — no food, no birds. We will know things are getting better when we have 1,500 to 2,500 nesting pairs. Let’s hope that number is reached in the near future. This is yet another stepping stone to secure the presence of many of our wading birds, especially the wood stork. Bob is a Master Naturalist and owner of Steppingstone Ecotours. He is also a member of the Dolphin Explorer’s 10,000 island dolphin survey team and a member of Florida SEE (Society for Ethical Ecotourism). Bob loves his wife very much! Who Cooks for You? An Owl? I am from California. Recently I visited Madeira beech in St Petersburgh beach area central Florida . Saw few wood storks, snowy egrets and night heron. the Wood storks were walking freely in the street and standing on the roof top. Picking up food crumbs from the street. It was shocking to me. It is it because the birds are loosing their habitats? I was trying to find more information about wood storks habitat changing . will you please tell me whether it is a common occurrence or not?